For those eager to revisit Dark Souls 2 with some promised adjustments to enemy layout, this trailer is worth studying. It's been a while since I played the game so I'm no authority on the gritty details, but chief among the obvious changes forthcoming in the new Scholar of the First Sin re-release is the appearance of the Pursuer boss in the early tutorial region. That should prove a nice kick in the guts for anyone trying to come to grips with the game, but then again, that's Dark Souls for you. That's providing you're willing to fork out cash for a game you've probably bought already. Dark Souls 2: Scholar of the First Sin will boast new story elements, enemies and events, and will bundle all previously released DLC also. 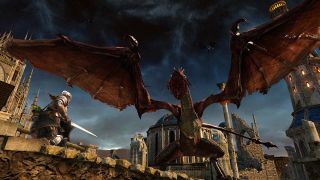 If you baulk at the idea of paying for the same game twice, a patch due later this week will introduce some game-changing tweaks to the vanilla version.